I never thought I’d say this about Isabel Coixet’s The Bookshop, but I honestly don’t know where to begin with this one. To call this movie “odd” would seriously be the understatement of the year; this movie is seriously one of the weirdest, strangest and completely confounding movies I have seen in a cinema in ages, and it completely caught me off guard by how baffling it is because, let’s be honest, who would expect utter madness from THIS movie?! It’s based on the 1978 novel by Penelope Fitzgerald, so I have no idea if anything that transpires in this film is lifted directly from that source material, but this movie and how it is made is so completely nonsensical that it defies all sense of logic. Coming out of this movie, I seriously forgot for a moment how movies worked; that’s how much I was in awe by how batshit insane this film is, and not in a good way, not at all. Seriously, what I’m about to describe to you may not sound that strange, but trust me, you’ll want to stick around for this one. So, the plot is that in the late 1950s, widower Florence Green (Emily Mortimer) purchases the abandoned Old House in a small coastal town to set up a bookshop. However, she soon attracts the quiet wrath of influential socialite Violet Gamart (Patricia Clarkson), who wants to get rid of the shop so she can set up an arts centre in its place, but Florence remains determined to keep her dream alive, in doing so attracting an unlikely supporter in the reclusive Edmund Brundish (Bill Nighy). That sounds pretty straightforward, doesn’t it? Oh, but I was naïve too when I first read that synopsis. I thought to myself that this would be just something that was merely harmless and completely transparent in my mind once it was over. I didn’t think for a minute that every single second of this movie, I would be simultaneously bored out of my mind and also fascinated by how much this movie just doesn’t add up in any department. Yet, here we are. Aside from the fact that absolutely nothing happens in this movie that’s neither interesting nor substantial to the plot, this is a script and direction that is so awkward that it really defies explanation. I’ve seen one of Isabel Coixet’s films before – that would be Learning to Drive, which also featured Patricia Clarkson – and from what I remember about that film, it was perfectly harmless and had a sweet bit of humanity to it. Somewhere in between that film and this one, an alien must have abducted her and possessed her body, because nothing she does in either her direction or her writing in any way resembles anything that a normal human being would say or do. The actors all perform like they’re in a community theatre production, stiffly staged and misdirected as unintentional caricatures (one antagonistic character, a brash and arrogant ladies’ man, looks and speaks like the most closeted individual you could have come across in the 1950s, and I know for a fact that the character was not meant to be that way). There’s a central child character who is wildly inconsistent, speaking like an adult and using advanced vocabulary to highlight how precocious she is (to a point where you question what kind of kid talks like this), to suddenly giggling at a series of obscene postcards like an actual kid. Most of the inhabitants of this little village are either nosey as all hell, so much so that you wonder why the main character doesn’t tell them to back off like anyone else in that situation would, or so stilted because the majority of the actors here are awful. Emily Mortimer really does her best, but she always has facial expressions after each line of dialogue that look like she is both cringing and genuinely confused by the lines and direction she has been given, and not even Bill Nighy – one of the best parts of the movie, only because it’s Bill freakin’ Nighy – can seem to lighten the drab and miserable atmosphere this movie provides. Then, there’s Patricia Clarkson’s character, who is quite possibly the worst possible excuse for a villain I’ve seen in a movie all year. The American actress’s wobbly English accent is the least of her problems, because this character just straight up makes no sense. Here’s a highly influential figure in this town, rich and powerful, and eager to open this arts centre, which is all fair and well – but why on Earth does she want the Old House so badly for it? Like, seriously, there is no reason given for why she so desperately wants it for her own purposes, nor is there anything preventing her from acquiring one of the many other buildings up for grabs; why this one exactly? It’s never explained, and it just makes her look like the most petty and insecure woman with the most pathetic rationale for deciding to go up against the main character, and the fact that she goes so far out of her way to derail the shop and drive it out of the premises – to a point where she’s even goading her nephew, a Member of Parliament, to help pass a bill that will effectively evict her and her shop – when there are so many other things she should be doing instead (she mentions that she’s in politics; has all of that been put aside just so she can screw over this woman who’s done nothing bad to her? ), it just makes you want to punch this stupid woman, and not because she’s a villain, but because she’s a horribly written and executed villain, which Clarkson’s pantomime performance really doing her no favours. It’s such a pathetic character, one who you’re constantly baffled by how much her plan makes absolutely no sense and lacks proper reason for being evil other than for the script to provide a villain for the audience. This may already seem like a long review about this one movie, but trust me I am only scratching the surface here. There’s so much more about this movie that I just don’t have space to go into, not to mention certain parts require me to go into spoiler territory which I would prefer not to do, only because you kind of have to see this mind-numbing trainwreck for yourselves. Just like I was, you will be astonished by how much this movie is failing to set itself in any kind of normal reality, and once you see the choices that went into making this movie, from the direction to the writing to the acting, it will really make your head spin from just how much this movie is screwing up. 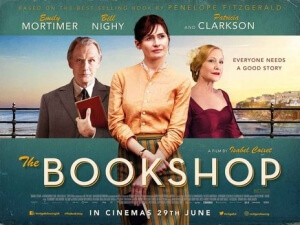 I am not convinced at all that this was made by someone from the planet Earth, because it is seriously one of the most out-there experiences I’ve had watching a movie in a long, long time, and again I never thought I’d say that about The Bookshop, of all things. So, in a very light sense, I am recommending this movie, if only so you can see the absolute containment of insanity that I saw. I refuse to believe anyone who says that this film was made by someone with human emotions, because this movie gets so much wrong that it’s impossible to look away from it or even ignore it. Approach it with trepidation, but don’t come crying to me when you’re confused by it. The Bookshop is… erm… I don’t know what this was. Just see it for its complete and utter insanity, for the love of God.